This envision project focuses on the Arizona Center, bound by Van Buren, Fillmore, 3rd and 5thStreets. Since its opening in 1990, the Center has experienced ups and downs as it has struggled to find its place within the downtown retail scene. Once filled with retail on the ground level with a food court above, the current mix heavily relies on restaurant and bar uses, while the upper floors have been converted to office space. Two visions have been developed. The first, shown above, shows how the Center could transform by building out its site without major redevelopment of what currently exists. The second, below, transforms the Center into a true urban mall by opening it up and completely rethinking the existing layout. When it opened, downtown was a much different place. To the north and east were empty lots and dilapidated housing; to the west, 3rd Street ran below grade to the Phoenix Civic Plaza, making for a non-existent pedestrian experience. Because of those challenges, and the fact that only two of the six planned towers were constructed, the Center orients itself completely inward with walls facing each of these directions, with only one inviting entrance on the southwest corner. This vision imagines the surface lot fronting Fillmore being developed into 3, 8-story apartment buildings similar in scope to the Skyline Lofts across the street. The ground levels will contain retail, complementing the retail across the street and creating a vibrant neighborhood district, while the influx of tenants will help bring in – and keep – top retailers. Next, the current AMC has large setbacks on all sides that could easily be wrapped in retail. Doing so on Fillmore would continue the retail street being described above, while a wrap on 3rd Street would reduce a giant dead zone and create a proper terminus and focal point for ASU’s Taylor Mall. Here, a signature restaurant or café could spill over onto sidewalk dining and create an enhanced street scene. Furthermore, the existing AMC is oversized at 24 screens – a trend in the 90s that has gone by the wayside. By reducing the screens, space opens up for a small box retailer on the north side such as a CityTarget. Such a store would cater perfectly to students and residents nearby. Lastly, a new box office and entrance would be created out of an existing exit on 3rd Street to reduce confusion and turn the current inside entrance out. 3rd Street is an important corridor, as it connects the Evans Churchill neighborhood to ASU to the greater downtown, and runs directly past the convention center hotel, where thousands of guests stay each day. Currently, these guests stare at the blank beige walls of the Center; to reduce this sea of beige monotony, a grab-and-go stand would be built outside the loading dock zone where conventioneers (or students, or anyone) can pick up a quick bite to eat as they rush to their meetings. Finally, the last area to address is the corner of Van Buren and 3rd Street. Here, there is another large landscaped setback that could easily house a restaurant. A Sam Fox restaurant with outdoor seating would liven up the area and create synergies with the Herberger Theatre and District Restaurant across the street. This project also looked at other ways to improve the Arizona Center. Below shows a plan and write-up describing a more intensive redesign in which Taylor Street and 4th Street bisect the site. By reducing the size of the AMC to 16 screens, the Center can be split and Taylor Street can be extended through it; doing so provides an important visual and physical connection between downtown, ASU, and the Biomedical Center, and allows for a “Mill Ave”-type corridor that is more appropriate as a terminus to the mall. The extension would be made into a shared zone, where cars, bikes, and pedestrians all share the same pavement, separated only by slight changes in grade and by bollards and other street furniture. This creates a vibrant environment for shopping and dining, with a clear priority plased on the movement of people vs. cars. Parallel parking on-street provides an additional buffer, while encouraging window shopping and alleviating parking concerns of downtown shoppers. By enhancing key pedestrian entry points into the Center through designated pathways highlighted by signage, the pedestrian circulation becomes more obvious and less insular. The new Taylor Street corridor allows the Arizona Center to gain a more traditional “mall” setup, whereby anchor stores sit at each end, with smaller retail shops lining the middle. This has shown to be a proven strategy for moving pedestrians and shoppers along in these types of environments and is possible through the reduction of the AMC, and buildout of the current garage and surface parking lot. These anchor tenants include the AMC, Target and Bloomingdales Outlet – which would be a first in the state and a further draw to visitors. The Taylor Street corridor allows for the overall configuration of the Center to become much more outward-facing and engaging to the streetscape. 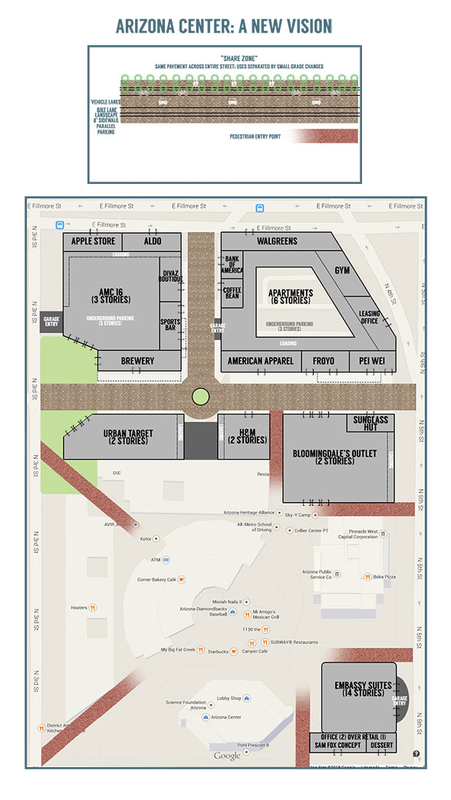 Taylor Street itself is lined on both sides with retail, while a new plaza fronts 3rd Street with entrances into the AMC, Target and adjacent brewery, breaking up the large beige facade that currently stretches from Fillmore to Van Buren. Meanwhile, Fillmore is lined with larger spaces that could be used to complement the retail across the street at Skyline Lofts through neighborhood services such as a pharmacy or phone provider. Lastly, a new hotel with an adjacent office and retail annex serves to activate the southeastern corner of the Center that is currently vacant. What ultimately makes or breaks a development like Arizona Center vs. one like CityScape is the amount of foot traffic each generates. CityScape, with its hotel and on-site apartments has built-in traffic that will serve to keep its retail offerings afloat. Meanwhile, the Arizona Center has only office workers who are there 9-5. By adding residential uses above the retail along Fillmore and 5th, and a hotel at the southeastern corner, the Center would have 24/7 vibrancy, adding to the daytime workforce and unique convention market it currently serves. Arizona Center btwn 3rd St. and 5th St.